Prime Minister Narendra Modi on Saturday inaugurated the 6.6-km Noida City Centre-Noida Electronic City section, an extension of the Delhi Metro's Blue Line in the neighbouring city. The prime minister inaugurated the facility during an event held in Greater Noida. 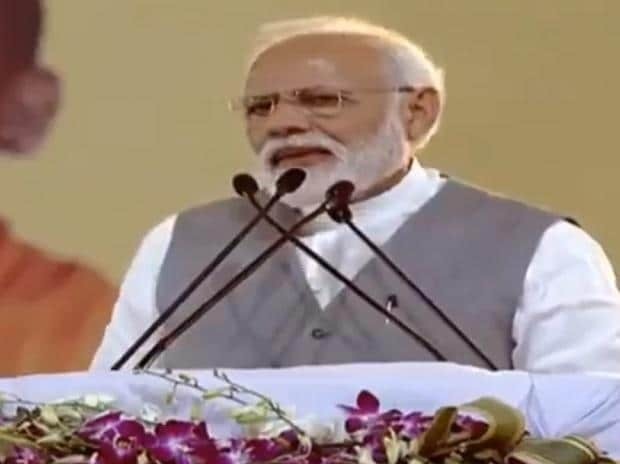 Modi also laid foundation stone of 1320 MW thermal power plant in Khurja, Bulandshahr from Greater Noida and for 1320 MW power plant in Buxar, Bihar via video link. Earlier, he unveiled a statue of Deendayal Upadahyaya on the campus of Pt Deendayal Upadhyaya Institute of Archaeology in Greater Noida. Uttar Pradesh Chief Minister Yogi Adityanath and Union minister Mahesh Sharma were present at the event. The completely elevated section with six stations -- Sector 34, Sector 52, Sector 61, Sector 59, Sector 62 and Noida Electronic City -- will benefit the people of Noida and connect the satellite city with the national capital. "Services will begin at 4 pm today. The frequency of trains on this new section during peak hours would be 5 minutes and 26 seconds," a senior DMRC official said. The total length of Blue Line, after opening of this section is now 56.6 km, from nearly 50 km span earlier that connected Dwarka Sector-21 in Delhi to Noida City Centre. Modi on Friday had inaugurated the 9.63-km-long Dilshad Garden-New Bus Adda section, an extension of the Delhi Metro's Red Line. With that new entirely-elevated section, the Delhi Metro forayed into the interiors of Ghaziabad for the first time, touching the industrial areas in twin cities of Ghaziabad and Sahibabad. After flagging off the Red Line section, Modi had also taken a ride in a metro train from Shaheed Sthal (New Bus Adda) metro station in Ghaziabad to Kashmere Gate station in Delhi, and on the way also interacted with commuters onboard. Came back to Delhi from Ghaziabad via the Metro. Commissioner of Metro Rail Safety S K Pathak had recently accorded the mandatory approval for the commencement of passenger operations on the 6.675-km Noida City Centre-Noida Electronic City section of the Blue Line, which was inspected on Monday, the official said. In a statement issued on Friday, the Prime Minister's Office said, "He will inaugurate the Noida City Centre Noida Electronic City Section of the Delhi Metro. The new section will provide a convenient and faster mode of transport for the residents of Noida. It will also decongest the roads and provide an environment-friendly mode of transport." After opening of the Noida City Centre-Noida Electronic City section, the total span of the DMRC is now over 343 km with 250 metro stations. The DMRC's span in Uttar Pradesh has now increased to over 59.5 km.